I'm so excited to share with you new tea cup to me. While I was visiting my mother after my vacation, she gave me a tea cup for my birthday in June. It looks very similar to this one, only black and gold. 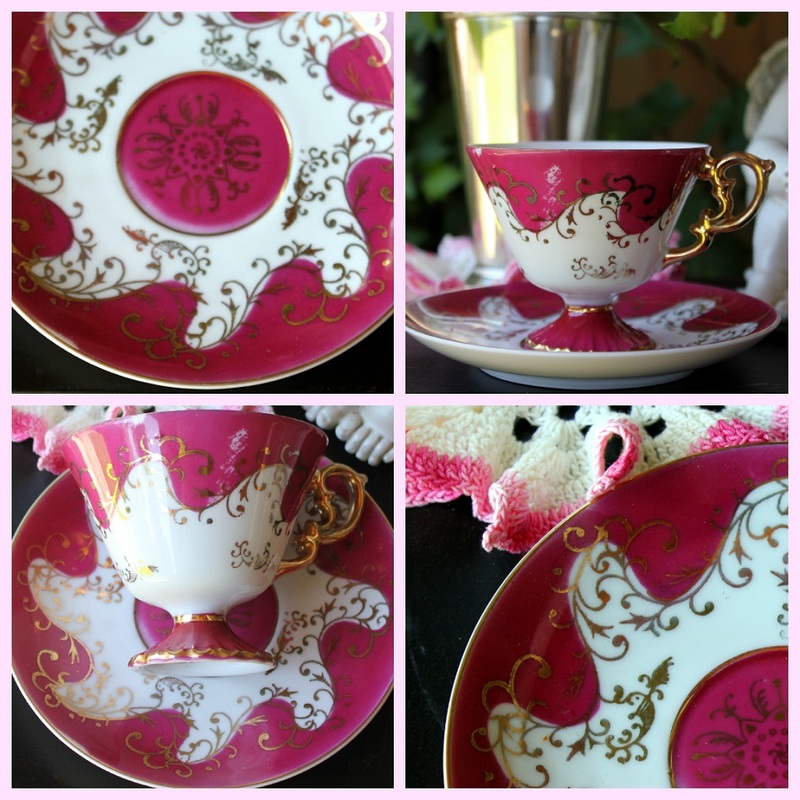 Last week a package arrived in the mail with this beautiful pinkish tea cup and saucer as another birthday gift. To see Birthday post with the other tea cup and saucer Go Here. I was inspired by this Pink and White vintage crochet dolly. I found this dolly at a garage sale. on more occasions than one. The valley had long been influenced with families from Spain, Portugal and the Azores Islands. The women were gifted with the talent to crochet every decorative accessory from dining tablecloths to sofa and armchair covers. I was most intrigued with this type of dolly. The women would soak the dolly in pure liquid starch and iron the edges until the dolly would stand stiff and surround the center of the dolly in a beautiful circle. Absolutely amazing. There were large ones with large ruffles and small ones similar to this one. I think I will start looking for one of the fine thread dollies and do some starching for myself. The beautiful 'Barbra Streisand' rose is a 2001 Hybrid Tea-Rich Lavender. With the heat in our Valley the color is more pink. The rose does best in cooler climates. I'm OF with my shade of Pink. I was so excited when I dropped by GW and was looking for a vase for flowers I found this Mint Julep Cup. And, as I have followed blogs for awhile I have noticed these beautiful Mint Julep vases and wished for one for along time. They are expensive at retail stores and on eBay that I hadn't bought one yet. I picked this cup up so fast you would have thought someone was going to grab it right out of my hand. LOL! Wishes do come true. There is something so special about 'Hand Painted' dishes. My little cherub with a darling little squirrel by her side. The patio is a wonderful place to enjoy the pretty things in life. Thanks Mom for the beautiful cup and saucer. I will treasure them always. Thank you for visiting My Cozy Corner today. I will be enjoying some parties, so please come along. Thanks again for sharing my pretties with me. What a lovely shade of pink for your gifted teacup! How special...and a gorgeous companion to the doily. Beautiful photos! I love the angel and flowers! Thanks for sharing and linking to Tuesday Cuppa Tea! Pretty pink teacup and roses. Sweet little cherub joining you too. Lovely shades of pink! I'm quite fond of any style of tea cup! Beautiful pinks, the roses are gorgeous. Thanks for sharing, hope you are having a great day! Betty, lovely tea vignette! I really like your new teacup ... such a beautiful color and I love the pedestal base and the charming, ornate handle. Everything is so pretty with the angel, flowers (good find on the mint julep cup/vase), teacup and crochet doily. Happy Tea Day! Your pink teacup is just beautiful! What a lovely gift from your mother and I know you will treasure it always. Your roses are gorgeous in the mint julep cup and make a lovely vignette for your special teacup. Cute little angel too. Your doily is charming and lends itself so beautifully to your flowers and teacup. Lovely photography! Thank you for sharing and coming to my party. Hope you have a delightful week. Your teacup, doilie, roses, mint julep, cherub - all gorgeous. I didn't know there was a teacup blog. Think I will have to check that one out. wow! That's a dramatic color and I LOVE it!!! Your whole post is pleasing to the senses :) Thank you so much for sharing! I love that old crochet piece. I am very drawn to old things - your cup and saucer and cupid look very sweet. Thank you for linking to Tea In The Garden! What a pretty cup and saucer, like the black one too. But the pink with that rose is gorgeous and the doily just adds to it all. Thank you for sharing. Gorgeous! Your new tea cup is stunning....what a shade of pink! It is very regal with it's high footing, and gold details. The vase too, is a fabulous find! I love the setting you have with your angel, roses, and new vase with your cup! So very pretty! Beautiful pinks and beautiful photographs. 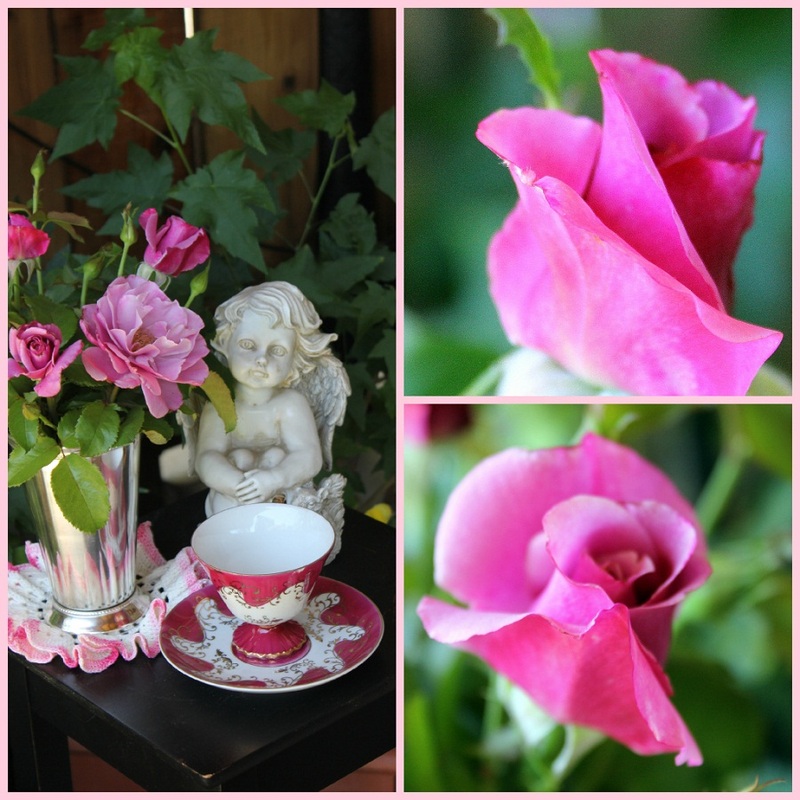 Such a beautiful teacup with the roses and cute cherub. The doily puts the finishing touch to the teacup. Beautiful photo's. Thank you for sharing. Love that vibrant tea cup. I think I love all shades of pink. Have a pink day! May your weekend be what you want. Absolutely gorgeous! Happy pink Saturday. Come and see my PINK entry, when you get a chance, thanks! PS.. I am now following your blog, it would be delightful if you can follow my family blog too, thank you! Visiting for Pink Saturday- hope you can stop by..
What an awesome birthday surprise. I love your saucer and teacup. It is truly amazing.